Trying to get away from navel-gazing and back to writing about growing things and making things, here's a post that turns a saccharine-sweet motto on its head. Last year I used bread yeast to make all my wines, with varying success. Some of them came out just fine, but several of them were far too sweet. The yeast just gave up and died before it had turned very much of the sugar into alcohol. I'm thinking of just adding some wine yeast and hoping it'll get started again, but in the meantime, it occurred to me that I could do with some decent vinegar for pickling samphire. The cider vinegar that I made last year developed a quite convincing-looking vinegar mother. I poured all the vinegar into a jug so I could scoop out the mother before returning the liquid to its bottle. I've chosen to use about half a gallon (that's a British gallon, so about two litres) of sweet beech leaf wine. I poured this into a large jar, plopped the vinegar mother in on top, covered it with a bit of old net curtain (it's important to allow air in, but not bugs and breadcrumbs and other things that might find their way in there in my kitchen), and added it to the general clutter on my kitchen worktop. At about this point in writing the blog post, I looked up instructions for how to make vinegar. The first useful tip I found was that vinegar can only be made in the dark, so I added a newspaper sleeve to my jar. I then got a bit concerned by the fact that all the instructions described a two-stage process, adding yeast first to make wine, and only then adding the mother to convert it into vinegar. 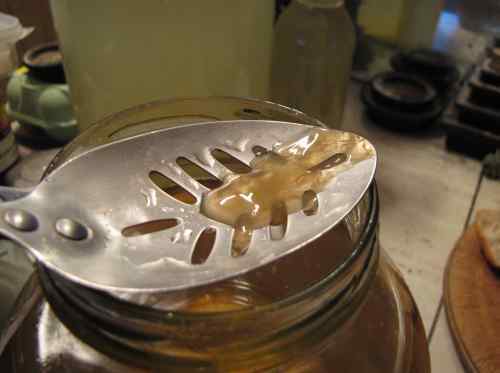 I was sure I remembered methods involving putting apple peels in a jar of water and leaving them... I found them again and even these seemed to assume that the yeast would get to work first and the bacteria would move in later. Hmm, maybe all that sugar wouldn't get converted. I sought advice on the 'ish forum, and the suggestion was that a vinegar mother would probably eat just about anything, so I left it alone to see what would happen. After a few days I couldn't see anything happening, so I bottled out and added a bit of yeast (wild, probably still alive). About a day later, I saw a film forming on the surface, which is a good sign for vinegar. Whether the yeast had anything to do with this or not, I don't know, but I'm happy that something is happening. I can expect this to take a few weeks, at least, to make vinegar. I won't ignore it completely, though, I'll keep sniffing it from time to time because after the vinegar's made, with continued access to oxygen, the vinegar mother will eat right through the acid, leaving only water. I think that's happened to a batch I tried before, which was very disappointing. Now at least, I know to watch out for it, and seal my vinegar into bottles before it goes over. 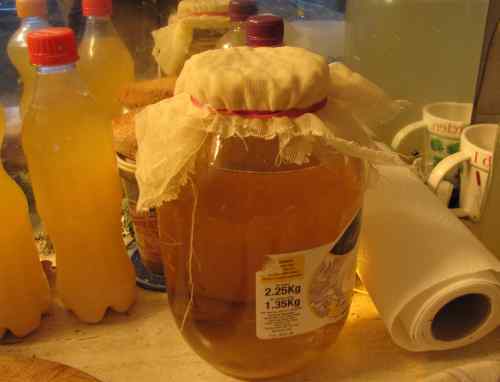 A note on using homemade vinegar for pickling: Most guides advise not to. This seems over-cautious to me. With the quantity of sugar I had in here, I was aiming for about 12% alcohol. Converting the alcohol to acid actually increases its concentration (oxygen is added to each molecule, making it relatively heavier), and the minimum required for pickling is 5%, so surely this vinegar is going to be plenty strong enough, even if it does go over and lose a bit. 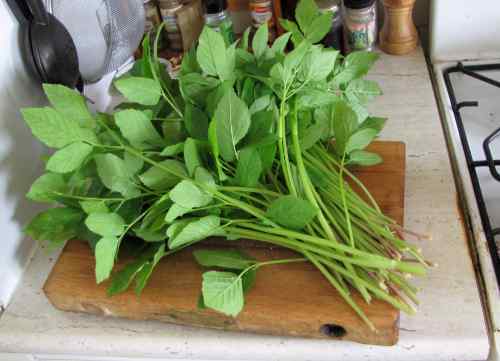 I recently learned that the larger, tougher leaves of ground elder can be good to eat if you cook them the right way, and that some people consider the stalk to be the useful part. I wrote a blog post about it for Selfsufficientish.com. We have been eating a lot of ground elder recently. This isn't a riddle, it's a question I've genuinely been grappling with recently. Let me back up a little. I've been suffering from depression over the last month or so. I've found this quite hard to accept - I get seasonal depression, I can't be depressed in the summer! - or even recognise. When the sun is shining, spring flowers are out and the birds are singing, it can be quite hard to see that underneath my appreciation of all this, there are still some serious problems. However, it got bad enough to force me to face up to it when I just couldn't face going to an event that I'd usually enjoy a lot. I've been talking to my dear friend Sarah, who is a counsellor and has been helping me figure out what's going on in my head. There are a couple of obvious things, like money worries and the general election result, but we've turned up some less obvious things too. One of these is loss of identity. I used to be a scientist, but I don't do science any more. It's been very hard to let go of; to accept that I no longer know what's going on in my field of research (or anyone else's, for that matter), that I'm no longer in a position to conduct experiments. If I'm not doing science any more, I'm not really a scientist, am I? I talked to Sarah about the difference between human being and human doing and, although I've come across the conceptual distinction before and it has intuitive appeal, if I'm honest, I just don't get it. I am wedded to the idea that what one is is defined by what one does simply because I can't envisage a human who is not doing anything. If you take away all activity, what is left? If anything is left, I can't see that it differentiates between one human and another. I'll try another tack. Suppose we take a quality such as, kindness. It might be true to say that someone is a kind person even when they're not doing very much at the time. But isn't kindness just a disposition to act kindly? I can't find any meaningful qualities that don't come back to action in the end. I am a human doing. So, what do I do? This a question that is often asked in social situations, when meeting new people. It's one I have trouble with; I don't really know what the answer is. It's not a bad question, and the person asking it is simply trying to find out a bit more about me. When I had a job that I felt reflected my personal identity (even, formed a big part of my identity), I had no problem with this question. Answering it would be a very concise way of conveying a lot of information about myself. Now, I don't have that kind of job. The occupation I've chosen is unpaid, but that's not the main problem. I'm not sure that self-sufficient is a very good representation of who I am, not least because I'm not very good at it. Competence is a big deal for me, but I'll leave that for another time. I now have a disconnect. I accept the identification of a person with what they do, yet what I've chosen to do with my life doesn't feel like who I really am. What am I, then? I think I've found an answer that might work for me. I used to think of myself as a scientist, but if I go back a little further, to my undergraduate days, I had a dual identity. I studied both philosophy and psychology and at the time, was equally happy identifying with either. I pursued psychology as a career mainly because it seemed like a more realistic option. Now I've stopped doing that, perhaps I can re-identify with the other branch of my studies? I never really left philosophy behind. Look at this blog post: It's all about picking ideas apart. Human being vs human doing? What does that really mean? What's the point of asking, What do you do? 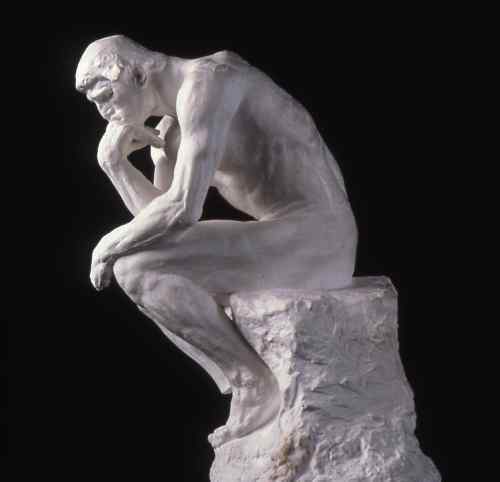 This is what I do: I think about things. I am a philosopher. That's not an answer I'll give when people ask, What do you do? It sounds pretentious and is also misleading. I'm not doing philosophy at the highest level, and I'm not getting paid to do it. However, it is an answer that gives me an identity I'm comfortable with. An intellectual life has value, at least in my world view. I need no longer feel that I'm trying and failing to be self sufficient. This answer is for me. I still need to find an answer for other people, for use in casual social situations, but I hope that now the question won't be poking at an open wound. If I'm happy with my own view of myself, I don't mind too much what other people think of me.